Includes (2) speakers only. Holes in front grill material. (See Photo). All photos are of our worst conditioned item in a lot. You will likely receive an item of equal or better quality than the actual photos. Speakers only. No wires or other accessories included. - Previously owned. Tested and working. Minor scuffs and scratches. A few blemishes. BUY ONE OR TWO SHIPPING IS FREE. Pulled from a set with a damaged cabinet. In excellent condition. Comes professionally packed and fully insured. Polk Audio Monitor Series 2 speaker - Works Great !! First of all, this speaker works perfectly but has no mounting bracket. Polk Audio Monitor Series 2 Surround Sound Satellite Speaker 10-100W Tested. Condition is Used. Shipped with USPS Priority Mail. Trending at $47.24eBay determines this price through a machine learned model of the product's sale prices within the last 90 days. Devices with a serial numbers will be recorded, any device without a serial number will be inconspicuously marked. Probably best used for parts for better looking enclosures. Part Number:RD 7096-1 M 70II. 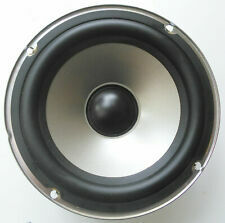 This sale is for asingle Polk Audio Monitor70 Series II 6 1/2" Driver Woofer. 6.5" Woofer. Will Fit Polk Audio Monitor series Speakers. We all make mistakes don't we?. Color: Silver. Polk Audio OEM RD4095-1 Monitor 40 50 60 series 2 1" Dome Tweeter - NEW! Price is for one tweeter. -Monitor 40 s2, Monitor 50 s2, Monitor 60 s2 and more. Re: 3.2 ohms. Impedance: 4 ohms. Height (inner arc): 2.32". Height (outer): 2.625". Width: 3.25". Will Fit Polk Audio Monitor series Speakers. Color: Gold. Used, expect sign of light scratches on the edges. This Is A Pair Of Cross Overs Out Of A Pair Of Polk Audio Monitor Series 2 Speaker. Tested And Is In Great Working Condition. Message Me If You Have Any Questions. Please Check Out My Other Listings For More Speaker Parts. Two 39" Tweeter wires (each has female quick-slides on one end and tinned wire on the other). Two 39" Woofer wires (each has female quick-slides on one end and tinned wire on the other). 2 Foam woofer gaskets. Marine Speakers. Outdoor Speakers. In-Ceiling Speakers. Floorstanding Speakers. Car Speakers. Two 2-way speakers. Speakers, Head Units & More. Car Alarms & Radar Detectors . Polk Audio OEM RD7095-1 Monitor 70 series 2 1" Dome Tweeter - NEW! Price is for one tweeter. This new batch is slightly lighter in gray then the older batches. -Monitor 70 s2. Impedance: 4 ohms. Height (inner arc): 2.75". Height (outer): 3". Width: 3.625". 5 out of 5 stars - Polk Audio OEM RD7095-1 Monitor 70 series 2 1" Dome Tweeter - NEW! 2 product ratings2 product ratings - Polk Audio OEM RD7095-1 Monitor 70 series 2 1" Dome Tweeter - NEW! Used MW5502 driver pulled from a working monitor Series 2 speaker. Tested, working properly. Polk Audio RM 3000 Monitor Series 2: 3.5" Foam Speaker Repair Kit FREE SHIPPING! Model #'s include Polk RM 3000 Monitor Series 2 and woofer part # is RD0303-2. Polk Audio RM 3000 Monitor Series 2: 3.5" Refoam Kit. 2 Foam Surrounds (F3-3). 1 Bottle of Specially Formulated Adhesive. 5 out of 5 stars - Polk Audio RM 3000 Monitor Series 2: 3.5" Foam Speaker Repair Kit FREE SHIPPING! 1 product rating1 product ratings - Polk Audio RM 3000 Monitor Series 2: 3.5" Foam Speaker Repair Kit FREE SHIPPING! There are 3 available for sale. No issues whatsoever.